Alaskans expressed extreme disappointment with Senator Lisa Murkowski’s co-sponsorship of the Regulatory Fairness Act, a bill designed to severely curtail the EPA’s authority to protect Bristol Bay from the Pebble Mine. The legislation, which was recently introduced by Senators Joe Manchin (WV) and David Vitter (LA), would severely limit the EPA’s Clean Water Act authority to restrict a project whenever it would have an “unacceptable adverse effect” on surrounding wetlands and waterways. This follows the EPA’s decision in February to begin a Clean Water Act process to block the proposed Pebble Mine, and an announcement by Pebble investor Rio Tinto on Monday that it was dumping its 19 percent stake in the mine. Building your own sink-tips can seem intimidating at first glance, but its actually quite easy. 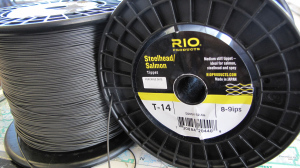 All that you need is bulk lengths of the sink tip of your choice (we use Rio’s T-series), braided loops to fit and some 15 lb Maxima Ultragreen. The shop sells T-8 through T-17 in both 30 ft lengths of bulk sink-tip and T-11 & T-14 by the foot. Pick up some bulk sink-tip, braided loops, 15 lb mono and you’re ready to go. Here are two different ways to go about making your own tips. This will enable you to customize the length of tips you wish to carry, and assures the highest quality of craftsmanship completed by yourself.